Happy, Happy Friday to everyone! How are you all doing? 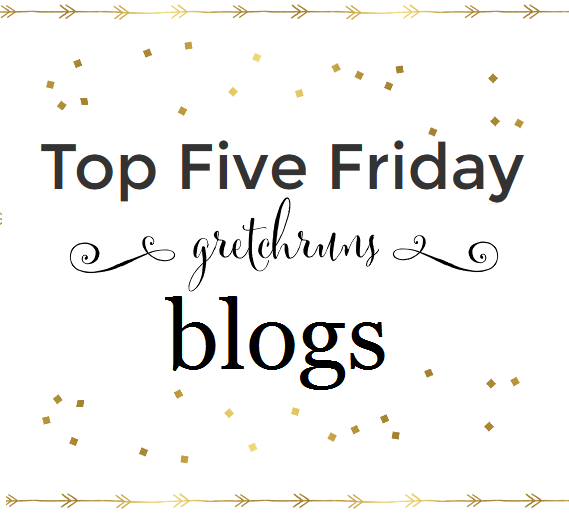 I'm so excited for this weekend, and especially excited for today's Friday Five post! The topic is Favorite Blogs, and I have a lot of them! I've been reading blogs for a few years now, and religiously follow my BlogLovin' list as well as Blogger Reading List. I love finding new blogs to read as well, so I'm excited to read everyone else's suggestions! Don't forget to check out the amazing hosts: Mar, Cynthia and Courtney! I'll be talking about my favorite blogs in five different areas : Makeup, Travel, Food, Fashion and Local bloggers. Hopefully there's something for everyone here! I also linked to my 3 favorite posts from each blog if you're looking for a few posts to get started. Hope you enjoy, and don't forget to leave me some of your favorite blogs below! I've been a long-time subscriber to Essie's You Tube channel and absolutely love her personality! Her blog is also amazing - I love the site design and her pictures are incredible. She does a lot of product reviews and has round-ups of her favorite products. I also love her adorable greyhound, Reggie! I found this blog when I started researching what to do in Europe. I love how each guide is only 12 hours worth of activities! Most websites I find have itineraries for visits of 3 days to a week! The pictures on this site are also breathtaking and make me want to plan ANOTHER trip! I've been reading Bakerella's blog for a long time, before she became such a celebrity! If you didn't know, she is actually the original creator of cupcake pops/cake balls/whatever you want to call it! She makes the most adorable desserts and even has her own line of bakeware! I have to blame Caroline for about half of my purchases ever since I started reading her blog. Her style is really similar to mine and I love how she mixes and matches her 37-piece capsule each season. She's about to move to Seattle for a few months and I'm so excited to see how her capsule will evolve and where her blog will go! Moving on to my typical Friday roundup of current favorite songs and shows! I love a lot of Maroon 5 songs, but this is my favorite. I like the driving beat in the background and the chorus is great! Gavin has one of my favorite voices, and I'm obsessed with this song! I heard it during a spin class (great song for a climb) and couldn't wait to listen to it over and over at home. I love, love, love acoustic songs, especially covers of popular songs. This one is really pretty and easy to listen to. I love this girl's voice! Nate Ruess has such an interesting and unique voice. When I first heard this, Dan said it sounded like the guy from Fun. (which is apparently on hiatus...sad news), which just proves how unique his voice is! This is a great song! In case you didn't know, this is my favorite song ever! I love it for running since it picks up tempo a lot in the middle of the song. I never get tired of listening to this song! I wasn't really a fan of the theme this week (Spring Break), especially since I'm still upset they're taking away the "Switch-Up" which was always my favorite week! My favorite dance was definitely Riker's...he's blowing me away lately! I can't believe I didn't like him at all the first week and I'm rooting for a showdown between him and Nastia. I also liked Nastia's dance but wasn't "wow'ed" by it. Anyone else think Derek should have taken the year off to focus on his show instead of trying to squeeze this in as well? I liked a lot of the performances this week: Meghan Linsey, India Carney and Corey Kent White were probably my favorites! I also enjoyed Koryn Hawthorne's performance, but there's something about her voice that bothers me. I can't put my finger on it, but this was my favorite performance of hers so far. Another week, another bottom 2 for Rayvon. I'm assuming he'll be in the bottom every week from now on. I was sad to see Quentin leave, and I was actually really disappointed in most of the performances this week! Everyone sounded pretty shaky and didn't seem that into it. I guess it's getting to the point in the competition when they're burnt out but still have a few more weeks to go. The Bachelorette won't be starting for a few more weeks, but promos (this 50 Shades of Cray one is great!) and spoilers are starting to come out about the upcoming season! I'm SO excited to watch, because Kaitlyn is one of my favorite contestants of all-time, and I'm interested how the two-for-one deal will work out. Also linking up with Heather and Clare! So many new blogs to check out! Thanks for the tip offs! Yay! I absolutely love finding new great reads. Thanks for this post! Have a great weekend! I have never heard of those Travel blogs. I love having a guide of suggestions of what activities to do before you arrive to your destination. 12 hrs is great. I would never be able to get away for a whole wk. They're really helpful! I hope they add more cities soon because they only have a few right now. Great list! I am excited to check all of these out! Like you, I love finding new blogs to follow. And I've never heard of the one local blog Apples and Kale (great name!) so that's first on my list! Thanks for the shout out, and have a great weekend! You would love her blog! Thanks, Gretchen! :) I really appreciate it! I haven't been blogging as much as I should be lately because my "day job" has been INSANE. Today is the last day of insanity, though, thankfully! :) Maybe we should do a local bloggers get together soon! I can't wait for it :) and I agree..GMW was the worst. great lists! i've been loving dwts this season and i can NOT wait for the new bachelorette season but if they send kaitlyn home i'm gonna be UPSET! Great list. 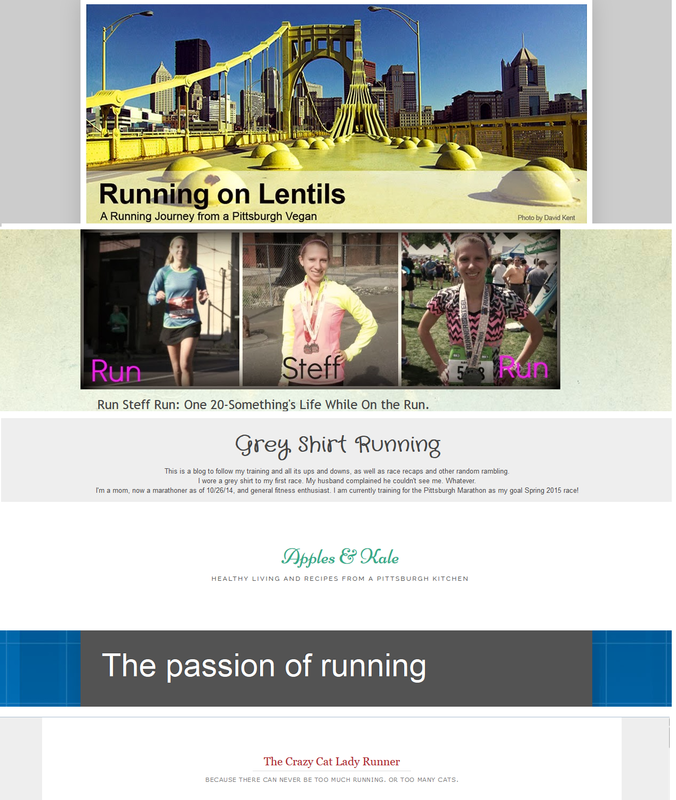 Read a couple of the blogs under running. Going to have to check out the rest. great list! I love the way you organized it :) excited to meet Jen next week in Pittsburgh! Thanks so much, Gretchen!! I hope you are having an awesome trip!